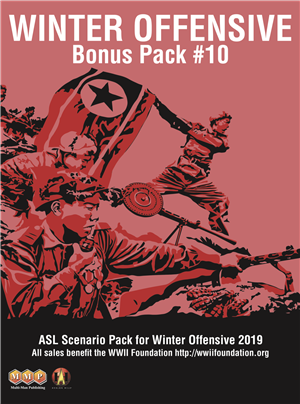 ASL Winter Offensive Bonus Pack #10 (2019) features four new scenario designs and two new maps (10a/b & 11a/b). MMP has an ulterior motive, however, for the manufacture and sale of this particular product. Proceeds from the sales of each WO Bonus Pack #10 are donated to the WWII Foundation. You get two new maps, four more ASL scenarios, and help a great project dedicated to memorializing the efforts of the men who fought in WWII get a very nice donation. This really seems like a win/win in our opinion.